To avoid conflict and make the best use of your precious planning time, consult this list of the wedding decisions you two should 100% make together. To those of you who can delegate wedding planning tasks to your partner: Consider running for public office, because you deserve to be in charge more often. 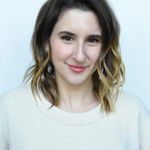 It is incredibly difficult not to Type-A the entire planning process, take on every single task yourself, and then explode under the enormous pressure about two weeks out from your big day (umm… I know this because... a… friend told me…? OK, fine, maybe I know from personal experience.) That being said, if you do take the split-everything-up-and-delegate-tasks route, it can be all too easy to let certain big day decisions slip through the cracks and make them in isolation—without consulting one another—which can, at its least, cause conflict between you two due to the lack of communication, and at worst, deprive you both of those magical wedding planning moments you deserve to have together. How do you know what to delegate and what to plan together? Here’s a good rule of thumb: Whatever seems really, really important…is. So don’t book it in a vacuum. And whatever seems really, really trivial… also is. 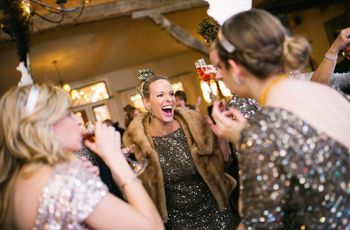 If cocktail napkins and envelope liners are on your to-do list, you can feel confident to take charge on those, without your partner missing out on anything major (unless, of course, they’re really into cocktail napkins or envelope liners—which is something you’d know, hopefully, beforehand!). Want to avoid any sticky situations? Here are the wedding decisions you should absolutely consult one another on rather than booking independently. There are a lot of things you won’t remember about your wedding day (sorry!). The songs you walked down the aisle to, and had your first dance as a married couple to, though? #Unforgettable. The processional not only sets the tone for the entire wedding, it’s also very symbolic of the two of you as a couple—so whether you choose a string quartet cover of a classic ballad or a soft cover of a cool rock song, you’ll want it to be something with a lot of thought behind it that makes your guests say, “That’s so them!” Your first dance is the same deal, with the added bonus of you guys having to dance in front of lots of people to it. So, don’t just pick these songs as a team—spend a long time picking them. Make your lists of picks individually, then compare lists, see which songs overlap, and choose from there. This decision should not be easy! 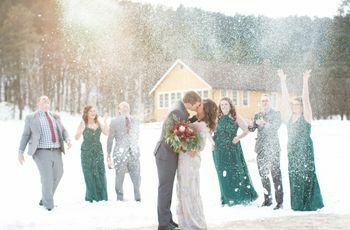 Yes, your wedding party should be the closest friends and siblings of the bride and groom—but before anyone’s officially asked and added to the roster, the group should be selected holistically by the married couple-to-be as a team. Because even though the wedding party groups will cater specifically to one side of the couple, they will come together a few times for parties and events in the days leading up to the big day, and they will definitely come together on the wedding day, where any underlying conflicts or misgivings between the groups (or the members of the groups and the marrieds-to-be) could come to a head. The bottom line? Both members of the couple should have a say on who’s in one another’s wedding party, because those people play a major role in the wedding day (and whether or not it stays drama-free). OK, so, one of you could care about almost nothing when it comes to the wedding. But even if all that were so, they’d still have to care at least a tiny bit about where the actual wedding happens. 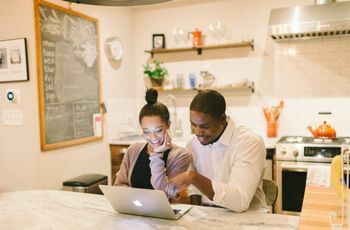 Picking the venue is usually the first big decision of the wedding planning process, so collaborating on it is a good way to see how well you’ll work together as a team later on. Plus, even if one of you is a little more “invested” in the wedding on the whole, choosing a venue you both really like is strategic if you want the less-invested half of your couple to get more into the planning process (if they aren’t the princess-castle type, you can all but say sayonara to them finding their inner wedding planner after you book a princess castle without consulting them). You’ll both always remember the place you got married (you might even return to it someday for anniversaries! ), and it’ll be important to you in that you’ll be inviting your closest family members and friends there, so you need to sign be equally passionate about it (or at least come to a happy compromise on it together). The wedding is all about the two of you and your guests, but the honeymoon is just about the two of you. Unless one of you is booking it as a surprise to the other (which should be something you agree on beforehand! ), the picking and planning of this very important vacation should be as 50/50 as possible. After all the hard work of wedding planning, and after finally marrying your one true love, you both deserve the vacation of your shared dreams—and trust me, planning a trip together is so much more fun and less stressful than planning an enormous, multi-phase party for hundreds of people! If you can’t totally agree on a destination, hotel or itinerary, get ready to compromise—maybe you’ll have to give up your dream destination in exchange for a super-luxe spa day, or maybe your partner won’t get that 10-day cruise that’ll make you seasick, but you can agree to a boat excursion wherever you do end up. Whatever you do plan, you’ll be so glad you planned it together. Deciding whether to have a religious ceremony or not, or deciding whether to write your own vows or go traditional, isn’t the most glamorous wedding decision you’ll make, but it is one of the most important ones. And even if you’ve never really covered it before in a convo with your partner (which wouldn’t be weird–after all, why would you? ), now’s the time to have the conversation. Making the choice to spurn tradition or religion without consulting your partner could really offend them—or worse, could be totally off-base with what they’ve always imagined for their wedding day. So, long before you decide anything else, decide together how you’d like to actually get married. Even if you’re on opposite ends of the tradition spectrum (unlikely since you’re probably pretty in sync), there are ways to meet in the middle—like having readings from religious texts rather than having your ceremony at church if you can’t agree on a full-on religious ceremony, or mixing in your own creative flair with traditional vows if one of you is a bit too shy to go all-in on vow-writing. The goal here is to craft a ceremony that speaks to the vision and beliefs of the both of you—so you both feel fully represented and at ease while tying the knot. Like your memories, your wedding gifts are the only things you carry on long after the big day. Ask your parents—some wedding gifts last decades! So whether you plan to register for household goods, cash or a honeymoon fund, don’t make any of these decisions without your partner, because whatever you choose will stick with you both, in one way or another, for much longer than your wedding day DJ or flowers. Wedding registry gifts are symbolic reminders of one of the best days of both of your lives, and also are supposed to be generous tokens of love from your friends and family to your new little family—so deciding what they should be without your partner in tow just isn’t fair. Even if they seem uninterested, or give you full reign of the registry because they trust your taste, you should resist the urge to take over, and instead make selecting your gifts a team effort. It wouldn’t be fair if you ended up with a very expensive haul of things only one of you wanted and would use—remember, it’s totally OK (and diplomatic) to ask for cash or gift cards! As long as you come to that decision together. Noticing a theme here? Most of the wedding planning elements that you should decide as a team are things that are directly representative of the two of you. 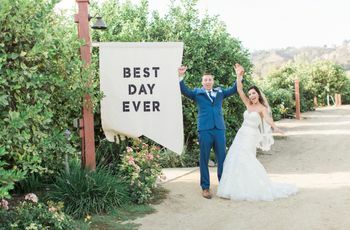 And things you’ll remember long after the sun sets on your perfect day—like what you said in your vows, what you danced to, who stood by you, and where you celebrated your first vacation as married couple. So don’t forsake making these memories perfect, together, for the sake of efficiency, or of crossing things off your to-do list. The extra effort will be so worth it—not to mention, excellent practice for married life!